Recently I came across a post on Lifehacker entitled How I Went Completely Paperless in Two Days and it reminded me of my half-assed attempt to go paperless. Paper is by far one of the biggest problems in our house. Various things get stacked and tossed in different piles. Most of the time it’s not an issue but then there will be times like at Christmas when I couldn’t find an important notice from my RRSP provider. Ugh. Evernote is a fantastic application which allows you to keep notes on anything. It’s web enabled so you can login to the website or install any of the desktop or mobile apps and view/edit/create notes from anywhere. It’s also FREE! Yes, this process of going paperless with Evernote can involve putting your stuff “in the cloud” and using Evernote may not be for you if that is a major concern. I say can because it’s possible to just digitize your papers and use a local notebook in Evernote and then nothing gets sent off of your computer. The downside of that is then you don’t get the built-in backup solution offered by syncing your documents with the Evernote servers. Evernote has gone to great lengths to show it is security minded. If you are still hesitant then it’s possible to encrypt notes before syncing but maybe going paperless this way isn’t an option for you. If you don’t already have an account, go to Evernote and signup for the Free account and then download and install the application on your computer. Oh, I have a note about free vs premium accounts later. So Lifehacker recommended the Doxie One or Doxie Go but both of these seem expensive for single function scanners that don’t make it easy to zip through multi-page documents. What you need is something with an Auto Document Feeder (ADF) and even more important, something that will scan double sided! You could go and shell out $450+ on a Fujitsu ScanSnap S1500 (which is one of the Evernote partner scanners) but I have a better solution that costs much less and offers much more. It has a 35 page Auto Document Feeder (ADF)! It can scan letter or A4 sized pages double sided (duplex) from the ADF! The included Canon MP Navigator EX software will actually create searchable PDFs! All of this from an all-in-one that can be picked up for less than $150 when it’s on sale (It’s on sale a lot at places like Staples). There are some older/cheaper multi-function Canon scanners that may provide some of the same features. I can’t really comment on others though as when I was searching for a scanner that did duplex scanning from an ADF, it was damn hard to find out that the Pixma MX882 did. Oh, and keep in mind that you are also getting one of the Premium Evernote features included with the Canon MP Navigator EX software – searchable PDFs! This is extremely powerful as Evernote will then be able to search the content of your PDFs, even without the Premium account. 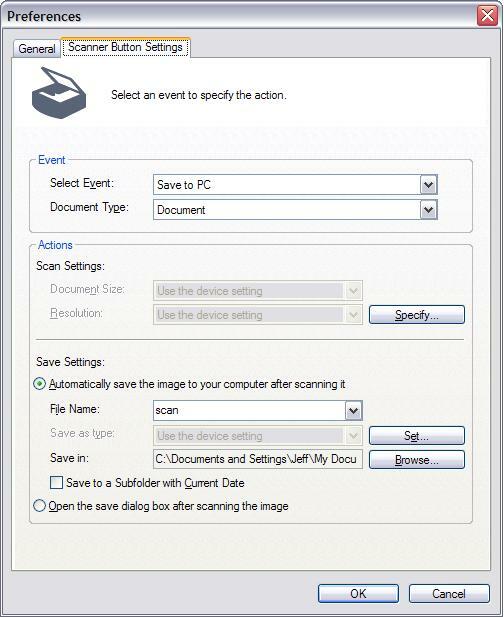 The Canon Pixma scanners are not “integrated” with Evernote like the Fujitsu ones or some other brands. That’s not a problem because Evernote offers the ability to monitor a directory on your computer for files to be imported automatically to Evernote. All you have to do is put your newly scanned documents into that folder and they get imported into Evernote. First, create a new notebook in Evernote called something like “Unsorted“. This is where our new PDFs are going to get imported. If you don’t want it to get synced, make sure it’s a local notebook. An advantage of making it a regular (synced) notebook is then you can sort and tag the contents anytime from anywhere via the web interface. This is also handy if you just scan everything as it shows up and then sort/tag the documents at a later, more convenient time. Next, create a folder on your computer that will be your “For Evernote” folder. I just have this on my desktop but it can be anywhere that make sense for you. Once you have the new notebook and new folder created, go to Tools -> Import Folders… which will allow you to add a new folder for Evernote to watch. Oh, and yes, I’m still running Windows XP on my PC so the screen shots I’ve included may look different on your computer. Hit the Add button and navigate to your “For Evernote” folder. 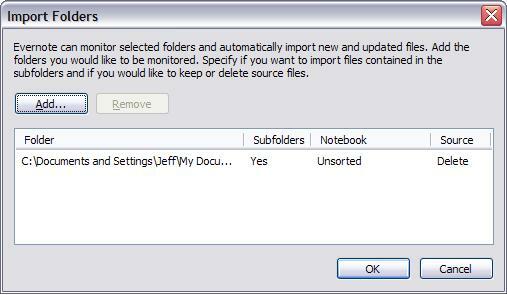 Then you just set Evernote to import into your “Unsorted” notebook. To have Evernote cleanup after itself, set the Source to “Delete” instead of “Keep”. This way your “For Evernote” folder will always be empty after Evernote had imported the new PDFs you add. 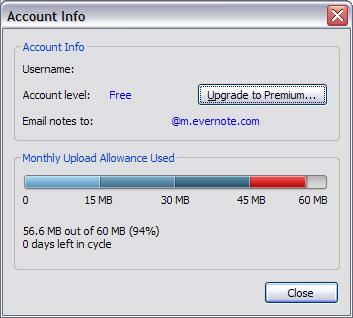 I haven’t needed the premium account as the amount of stuff I put into Evernote seems to stay under the monthly 60MB maximum. If you are going to scan everything at once, you may consider the premium plan for at least a month to get the 1GB/month of uploads. With the method described above, the worst case is your “For Evernote” folder has files left in it when you run out of upload allowance. At the start of the next month cycle they should just get uploaded like normal. Open the software and hit the Preferences button (it’s in the top right corner of the application in my version). Under “Save Settings”, you can do one of two things – either set the “Save In” folder to be the same “For Evernote” folder that you created before, or create a second folder that’s your temporary scan destination. Personally, I use a secondary folder because this gives you the opportunity to verify scans. You can use the built-in PDF editor in the Canon software to fix any PDFs that might have had extra blank pages added (due to duplex scanning from the ADF). Then you just manually move the scanned file(s) in to the “For Evernote” folder and watch Evernote import them. Now all you need to do is start scanning your documents. Unlike in the Lifehacker article, you can toss a multi-page document into the Canon Pixma’s ADF, hit scan and walk away until it’s time to load the next document. This is very handy as each document you scan gets saved as exactly that, one document. There is no manual post processing required to group scanned pages together. To make the most of this I try to toss a new document into the scanner as soon as I get it. Hit scan, walk away. Then I can come back later, verify it and move the PDF to the “For Evernote” directory to be imported by Evernote and stored forever. I can then grab the paper document and toss it into the shredder. Done! Once the document is in Evernote you can then move it to a different Notebook, add any tags you want or add extra text to the note. You have all the power of Evernote at your finger tips. This entry was posted in General, Technology and tagged Canon, declutter, Evernote, paperless, scanner on 2013/02/12 by Jeff Ivany. Nice timing… I was thinking of doing this exact thing. Well… at the very least scanning everything in to PDFs. Extra bouns is I’ve got a Canon Pixma All-in-One as well… older model though. Yeah, the whole “cloud” thing is a little hard to swallow at times. My biggest concern these days seem to be the major disasters – fire, flood, etc. That’s my big justification for putting scanned documents into Evernote or “in the cloud”. At least then I get offsite backup of the “important” stuff. Having access to those documents from anywhere has also proven handy recently. Thank you for this post! I’ve been wanting to go paperless for quite awhile but didn’t want to fork out more money for a new scanner when I already had the same model as you. Do you have a way to handle duplex scanning of odd shaped documents? I get a lot of stuff that is long and more narrow than a standard sheet of paper and my all in one doesn’t like it. Unfortunately I think the Canon Pixma ADF only supports letter or A4 sized pages. In general this works for me so I haven’t really looked at other options. The Doxie One or Doxie Go support scanning multiple sizes but don’t do double sided scanning. There are other options though if you really need to be able to scan multiple paper sizes in duplex.. Check out the Canon-P215. Wow! Great timing! I am a big fan of Evernote and just today adding another HP Officejet printer/scanner to the growing pile in my garage. Thanks!! Jeff, will it cooperate with Mac? If by “it” you mean the Canon Pixma MX882 then yes, it works fine with a Mac (I’m running Mountain Lion on a Mac mini). I’ve only had one issue crop up recently with the wireless scanning feature but I think it’s related to some issues I’ve been having with my wireless router (it all started at the same time). Basically, I now need to keep the Canon app open all the time or it won’t maintain a connection with the scanner. Not really a show stopper. Jeff, thanks so much for this post. I was working harder all this time not knowing that I had a smarter option. I am loving EN even more. Thanks!!! Thank-you for this article. I have the exact same device and was unaware of the Evernote watch folder feature. Perfect! I especially like how Evernote can delete the content from the watch folder after import. Thanks for taking the time to share! Does the Canon software have an option to ignore blank pages? I like the duplex and would like to set that as the default–but sometimes content doesn’t flow to both pages in the packet and I’d like to have those automatically removed. Thanks. I don’t think there’s an automatic way of doing it but the Canon software does allow you to edit the PDF to remove/reorder the pages. I’ve done this numerous times. This solved a major workflow issue for me. Thanks loads! Thanks for the fine article. I did have my cheaper Canon and EverNote set up to do this already. But I really appreciate the secondary folder idea and the tip on auto delete. That makes the process even better. Thanks. 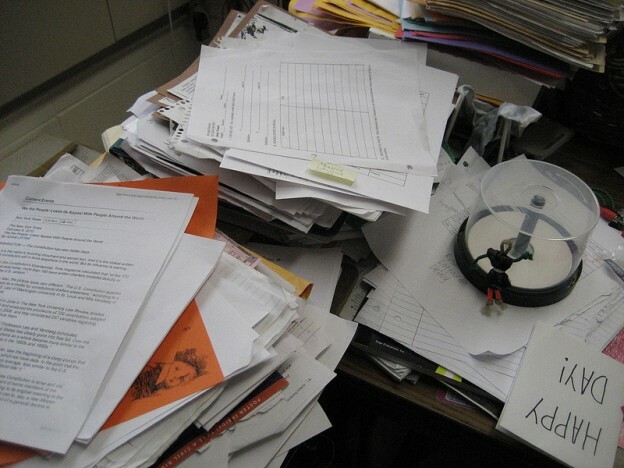 This main message of this blog post is still true – it’s good to go paperless. I think it assumes the user is running Windows and prints frequently so that the Pixma is a good solution. If you do not print frequently, inkjet printers get jammed with dried ink in the cartridge, which is why I, a former pixma owner, switched to laser for printing. Second, only Evernote for Windows has the directory scanning function. They did not implement it , at least not yet, in the Mac version. To solve this, you can create a service written in applescript to detect and import files into Evernote, or use a Snansnap ( i have the S1300i portable one ) which comes with scan to Evernote features. Thank you for sharing your solution. A few years ago, all of my paper files were destroyed during a move, and I decided then to scan everything into the cloud to keep that from happening again. Fire and water damage can render your paper documents useless, but your cloud file cabinet ( evernote ) will still be there. Thank you. This article and others’ reflections on it will help me make a decision on a new Canon scanner. I have been using the CanoScan Lide 210 and 3 of the same, before it, since they first came on the market as I move about doing genealogy. I have loved being able to create instant PDF’s so easily with Canon’s program that comes with them. For my purposes it is a much more readable and stable document. Just before your wonderful review is a note from Canon that shows that the PIXMA I am thinking of buying and Evernote work together. Love Evernote and have wanted to be able to scan straight to it. With your information, I will now also be looking at a duplex scanner to import my genealogy documents into Evernote. They have grown to needing a small climate controlled storage unit, just for them. It is time for the Cloud and Evernote is the best for my needs.